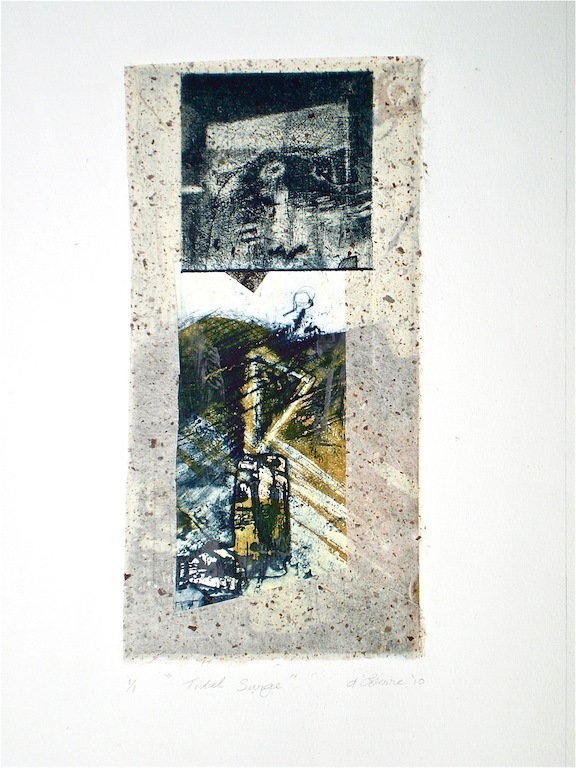 Etching by Water, 2014, intaglio and frottage. Rust 1, 2014, intaglio, collage and staples. Three artworks from my series titled And then the Ocean Rusted were the first to be sold on opening night. What was very heartening was the ‘return’ of “Karijini” to Perth in Western Australia by the purchaser, artist Susan Griffiths who works in similar media using frottage, but pushing it further than I do, and is exhibiting in Perth as I write. The second image was about Weano gorge. The purchaser had embarked on an extensive bush walk in Karijini National Park in an area referred to as the Pilbara, at this particular location, descending into to this very deep gorge where to viewers from above, situated at the lookout, a person below was barely visible. My frottage was taken from the rim of the gorge. Rust 1 taken home by an artist, ceramacist and scientist who also walks in out of the way wild places. I heard on Radio National a very apt description by Andrew Denton who referred to this exploration in the Outback as, quoting from memory off the top of my head, ” the search for wild places that imprint on the heart”. Loved it. The other wild place, Lake Mungo, while not 3 billion years old like the Pilbara, is known for its 40,000-60,000 (circa.) archaeological Indigenous history and its haunting landscape. The Sound of Mungo, 6/8, V.E. 2015, intaglio and silver leaf. Occasionally a viewer would ask what V.E. stands for – Variable Edition. This type of edition stands in contrast to the traditional Edition where multiples of the one image are reproduced, for example 1/100 up to 100/100. A large edition is possible with a zinc plate and a larger number of images may be reproduced from a copper plate which is harder than zinc. However a collagraph plate is often not as robust and degrades quickly, cardboard especially and even on masonite – like material the surface texture may be fragile. My reason for variable editions has nothing to do with these technical factors but is about boredom which descends when I just reproduce one image after another. My brain demands continual push and pull of the pictorial, textural and formal elements in various compositions and formats to feel satisfied. Then I often see things in different ways taking me off in other directions or a further development of the one I’m working in. The purchasers of these three images love the environment and are engaged in various activities both employment, activism and hobbies that nurture out habitat. Closer to home Tidal Surge is from my series Return to Sand and Water about erosion at Point Roadknight along the Great Ocean Road in Victoria areas and tracks of which are frequently walked by the purchaser. As years roll on more and more of this intriguing landform gradually being lost to the sea diminishes in size and texture. For instance the often termed Petrified Forest that is a part of this small promontory, consisting of mineralised root systems that resonate with images of ancient ruins, has eroded into rubble with very few ‘columns’ remaining. I feel as though I am recording one effect of Climate Change as seas rise. Categories: Collaged etchings, Frottage | Tags: Etching, Frottage, Pilbara | Permalink. Hi Deb thanks for your compliments. Congratulations on your sales – they are beautiful pieces. Interesting that artists bought two of them, but clearly all really connected the works with the places. I agree completely about printing editions – it becomes such a chore and I prefer the immediacy of developing an image and allowing it to dictate where it goes next, rather than having to make each one the same! Thank you Anna for your lovely comments and I’m sure we’re not alone re. printmaking.